All the questions we have been asked before. How often did you shower? Nope, we never showered. Not once. We carried flip-flops in high hopes, but that was wishful thinking. Flip-flops would not be the right choice anyway if you want to bring sandals, bring open ones so that you can wear socks in them. We would not bring sandals at all. There was no running water in most of the places (every place higher than Namche), and it was simply too cold even to consider. But that could change at a different time of the year. Did you bring a water purifier or iodine tablets? We purified our water with purification tablets, at all times – and highly recommend it. Either the water came directly from the glacier, or we filled it up in the lodge. For hot water, they usually charge a decent amount, but it can be great at times to have something warm to you, – especially if you start your day early. After the upfront costs of trekking equipment, flights, and park permits, it’s surprisingly cheap to hike the Everest Base Camp Trek independently. As for costs on the trek, a good rule of thumb is 25$/ per person per day, some buffer already included. Check out Everest Base Camp Trek on a Budget for detailed information. Since you are sleeping in teahouses, you don’t need a whole lot. Pack a thick sleeping bag. Bring a headlamp; the chances are high that your lodge runs out of power; also perfect for late night walks around town. 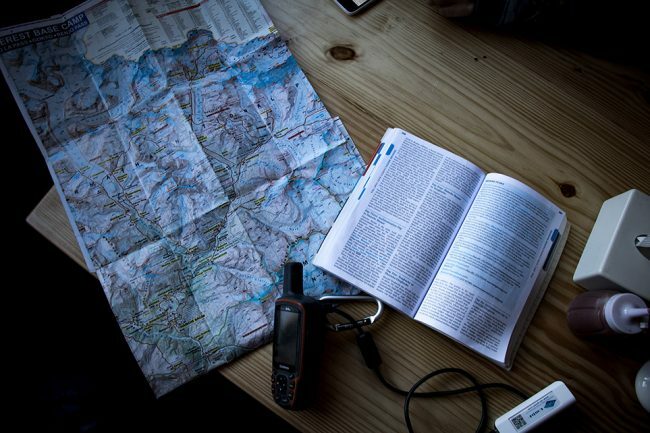 Pack a whistle (often attached to a hard shell jacket or backpack already) and a phone in case of emergency. (Polarized) Sunglasses are a must. Consider bringing hiking poles; we love ours! 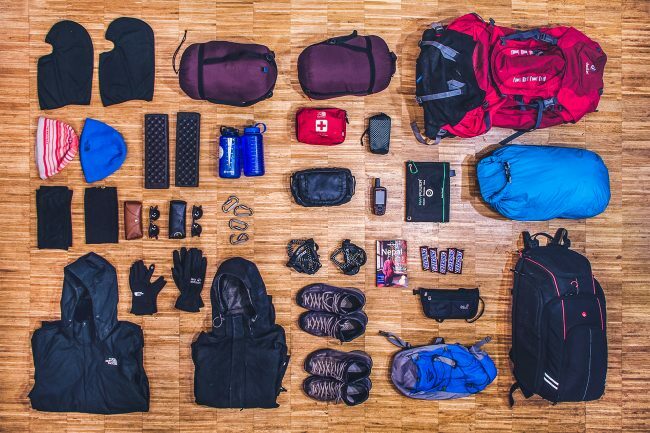 For a complete guide, check out our packing list. We enjoyed our time away from the interwebs and went without it throughout the trek (except for the free Wi-Fi at Cafe de 8848 in Namche). However, most teahouses provide Wi-Fi for a surcharge (around $5 for an hour/a stay). If you can’t go without the internet, consider buying a prepaid Data SIM Card. Ncell provides a high-speed 3G internet service for the Everest region; reception isn’t always good. SIM cards are cheap and can be purchased in many stores in Kathmandu. All SIM cards are registered; the outlet will take a picture of you and copy your passport. The teahouses in between Lukla and Namche charge for electricity, yet you received free electricity in Namche? Yes, our room in Namche was equipped with a power plug. It’s the main trading center for the Khumbu region, and as the gateway to the high Himalayas almost every trekker hiking in the area will visit and stay for a day or two. Consequently, it has better amenities. Still, don’t count on having free electricity there. Do you need mountain climbing experience? Our greatest mountaineering performance to that point had been climbing Pico Ariero, Madeira’s highest peak with a colossal 1.818 m (5.965 ft). Of course, it would not harm, if you were experienced, but you don’t need to have any technical climbing experience or altitude experience to complete the trek. How flexible is the airline, especially with open-ended tickets? Yeti Airlines (operated by Tara Air) has been extremely flexible and accommodating. We carried way too much stuff (more than the allowed 10kg), and that wasn’t a problem. On our way back we could change the flight without trouble. We did not know when we would return and took the plane out earlier than originally planned. Those clean bed sheets were calling! 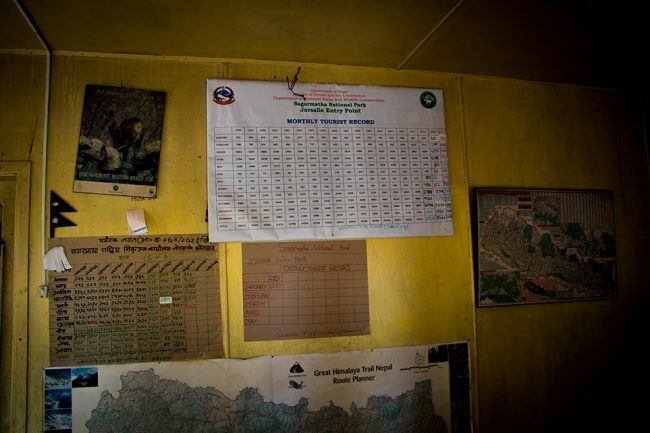 We needed to change our return flights before 4 pm at the counter in Lukla the day before departure. It’s quite common to change your flight date. Since the airlines cannot guarantee you that they can fly on your booked dates, there are no strict regulations the other way around. Just make sure you have some extra days for bad weather conditions. Where did you buy your flight tickets? We booked our flight tickets online. On which side of the plane should I sit to have the best views, flying into Lukla? The biggest danger is altitude sickness. If you listen to your body, drink a lot of water and don’t skip acclimatization days you should be able to adjust just fine. Keep your stomach happy by going vegetarian, as the meat up there has already traveled for a while. No matter how well you take care of yourself, don’t ignore symptoms of altitude sickness. More severe symptoms generally occur above 3600 m. If you have severe symptoms you should descent as soon as possible. If helicopters don’t fly due to bad visibility, but you can’t descent on your own, get at least two people to help you. I just arrived in Namche with my boyfriend. The climb up was so exhausting, that I don’t think I can go all the way. Any advice? The climb up to Namche is tough. It’s also the first ascent where you start to feel the altitude. Don’t skip your acclimatization day tomorrow, but also don’t rest in Namche, hike up to a higher altitude as part of your acclimatization, while coming back to Namche to sleep. You will enjoy hiking without your heavy backpack; this should induce you to leave stuff behind in Namche as well. Your teahouse will store it for you. Every gram counts! You don’t need all that toothpaste! Take it easy, avoid rushing, take breaks and look around. You are the last to arrive at the lodge? So what, you were the one enjoying your surroundings the most. I remember two climbers descending on our way up to Namche, while I felt exhausted, they had huge smiles on their faces, telling us »you will love the day when you can run down as well!« And we did. Do you cross any portion of the Khumbu glacier on the trek? Yes! You cross the Khumbu glacier four times: on your way to Gorak Shep, on your way from Gorak Shep to EBC and the other way around. Weather conditions can obviously vary from trip to trip. We did not encounter snow. But we planned on doing the Cho La Pass and canceled due to the severe weather conditions up there. We did confront violent winds though. (Which forced us to cancel the day trip to Kala Pattar – which sucked). What were you carrying in your bag that you had 17kg of weight? We carried a range of extras that you won’t need to complete the trek. We had a lot of camera equipment (DSLR, lenses, microphone, GoPro + gimbal, small tripod, heavy batteries, extra batteries, not one but two power banks, a solar panel…). It added up to an additional 8-9 kg. Since we originally planned on doing the Cho La Pass, we were carrying crampons as well. Besides, we took a fair amount of Snickers (and we never regretted it), brought some games and a guidebook. We packed a good assembled first aid kit as well. Don’t forget the sunscreen! Besides the extra, the backpack weighs 1.5kg, our sleeping bag weighs 1.5 kg, and we each carried 2 liters of water most of the time. Combined with all the clothing, it added up. If you read our blog post, you will know that we left a large amount of stuff at our lodge in Namche and picked it back up on our way down. You should reconsider your priorities there, as you will most likely bring too much. Aim for 10 kg. 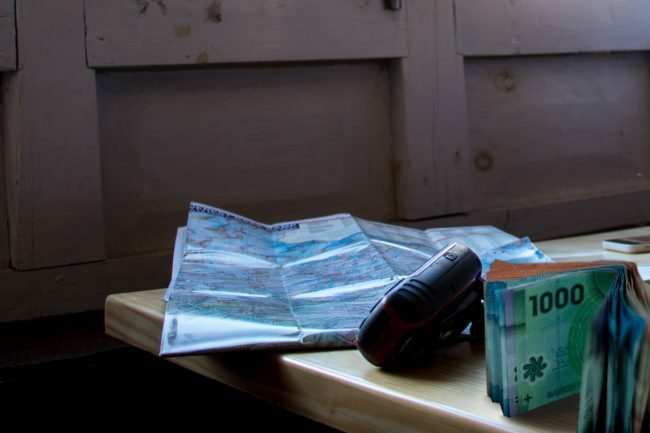 Can we withdraw money in the Everest region? If you are lucky, you can find a working ATM in Namche. But don’t rely on it, as they are not compatible with every credit/debit card and run out of cash fast. Bring your money from Kathmandu. As a good rule of thumb, withdraw $25 per person per day. Can we leave our packs at the teahouse to summit Kala Pattar? Absolutely. You’ll be passing Gorak Shep and can leave your things there. The trip from Lobuche to Gorak Shep is just a couple of hours. You could go to Everest Base Camp and Kala Pattar all on the same day. But I wouldn’t recommend it. For best views, climb Kala Pattar early in the morning for sunrise. Return to Gorak Shep for breakfast, collect your bags and enjoy your oxygen-filled descent from there on. What month did you hike the trek? We have been hiking the EBC Trek in February. It’s one of the colder, less traveled months, but we were incredibly lucky with the weather conditions and had a clear view and blue sky almost throughout the entire trek. In hindsight, we would now go a few weeks later, when spring is already approaching. Great video and website, well done. thank you so much for the kind words. I had a mild headache from Namche on, but it was never terrible. We didn’t take anything against AMS (Diamox can be helpful), if you take it slow that shouldn’t be a problem, just don’t rush it and drink lots of water. Don’t forget to take the acclimatization days in Namche and in Dingboche! We slept ok, the nights were not our favorite part and they can get really cold… Of course, that depends on the time of the year. For us, (in February) we had some terribly cold night with -4°F (-20°C) in the room. Definitely bring a good sleeping bag (-40 degrees) & a secret friend: a good lip balsam! Here is a list of all the gear we used during our trip. We also made a movie about our trek. You will have an exceptional adventure. Thanks for writing this blog. This is very helpful!!! Thank you. When are you planning to hike the EBC? If you need any pieces of information feel free to ask. Just watched your YT vid of your EBC trek – great stuff. I got a nice feel of your experience from viewing. I’m prospect to do EBC next year. It was nice to see you doing it during a time out of peak season. Credit to you guys doing it during colder inclement weather, plus arranging everything independently. I do a lot of canoe wild camping, trekking in general (which I share on YT channel MINDWISEMAN Maverick OutDoors), but Himalayas with EBC has been on my mind since I can remember so champing at the bit to do this soon as my circumstances have changed whereby I’m more physically able to do it now. Thanks for bits & bobs of information you’ve put up on this page/site & uploading your vid. Safe travels & “carpe diem” with lifes adventurers. Cheers! . Next year is soon! Which month do you have in mind? Fun that you mentioned canoe wild camping! One of our big delights are rubber raft wild camping trips. Like we did here. Doesn’t get much better! Ok, I am over at your YT channel now, subscribed, love it! Awesome video! I love it, and I learned so much from watching it. My friends and I (5 total) are going there this October 2019. Yup, trekking from Lukla to Mt. Everest base camp. I also read all your articles about gear and stuff to pack. Very very helpful. Thank you so much. Cheers! Thank you so much. I am happy you liked the video and found some helpful tips! Five friends? That’s awesome! You are going to make some pretty sweet memories. Have fun & safe travels!